In Gasaraki, the flames of war are fanned in the Middle East, as two secretive forces unleash their latest weapons of mass destruction. But in a world where giant robots are real, the most dangerous weapon of all lies buried within a human mind. Yushiro, the fourth son of the mysterious and powerful Gowa family, finds himself at the center of events that may change the future of mankind forever! 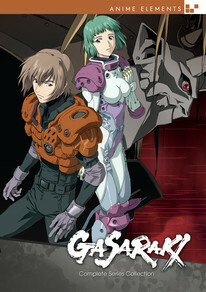 Gasaraki contains all 25 episodes. Special Features: Clean Openings, Clean Closings, Behind the Scenes. This is the Anime Elements release of Gasaraki.